Intro from Jay Allison: The thing about "Serial" is that it seemed so easy. That first season had such a simple narrative elegance in its tone and structure that it felt almost inevitable. It made you think: Hey, I could do that. I should produce a podcast like "Serial"! Then, if you did, you found out: Not so easy after all. In her long-awaited Transom Manifesto, Sarah Koenig breaks down just how tricky it can be to tell a story in sound. By deconstructing the Leakin Park episode, by explaining all the things her team was unable to get to create the story, she reveals exactly how they did create it. This, fundamentally, is how non-fiction narrative works. You try to get what you want, but ultimately, you work with what you get. Sometimes the obstacles make you jump even higher. Sometimes they're just obstacles. Sarah has given us an incredibly detailed map of the challenges of the documentary process. She even includes ACTUAL maps. And lots of audio. After you've absorbed all the lessons here, then, hey . . . you should produce a podcast like "Serial"! People often ask me: “How do you get people to talk to you? What’s your trick?” And I have to break it to them: Alas, I have no trick. I wish I did. Because like every other reporter, sometimes I cannot get the interviews I want. I’m here to tell you that this is a solvable problem. I know, because I have constructed a story — a successful story, I thought — without the benefit of my own taped interviews. Done right, nobody really notices that you had a tape problem to begin with. I’m not advocating this method, mind you. Certainly you should try as hard as you can to get the principal people in your story to go on tape. It’s just that sometimes, try as you might, you fail to persuade. But what I’ve learned is that when that happens, it doesn’t necessarily ruin your story. You can still manage to tell it — narratively, with emotion — using other tools: research, non-tape reporting, and creative planning. I’m going to take you through my interview-free story now, rip it apart before your eyes, and show you how I made it. Because it was a surprise, to all of us working on it, how it came together. The story is from season one of Serial. In case you haven’t listened to season one, it was the reinvestigation of the murder case of a guy named Adnan Syed, who was 17 when he was arrested for killing his former girlfriend. 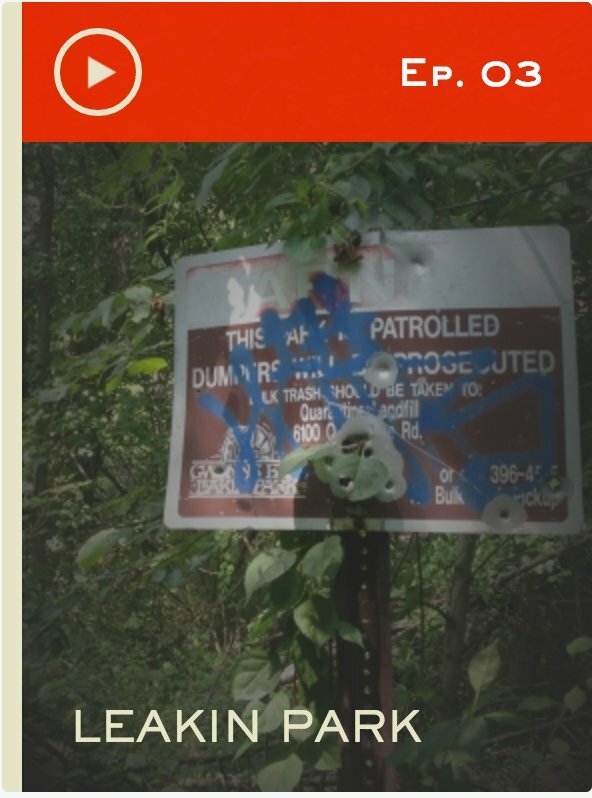 The episode I’m going to talk about here is episode 3, called “Leakin Park.” Again, if you haven’t listened, here’s what you need to know: Back in January of 1999, in Baltimore County, Maryland, a high-school senior named Hae Min Lee disappeared after school. Nobody had any idea where she was. The cops were searching for her. They were questioning her friends, her boss, her boyfriends. 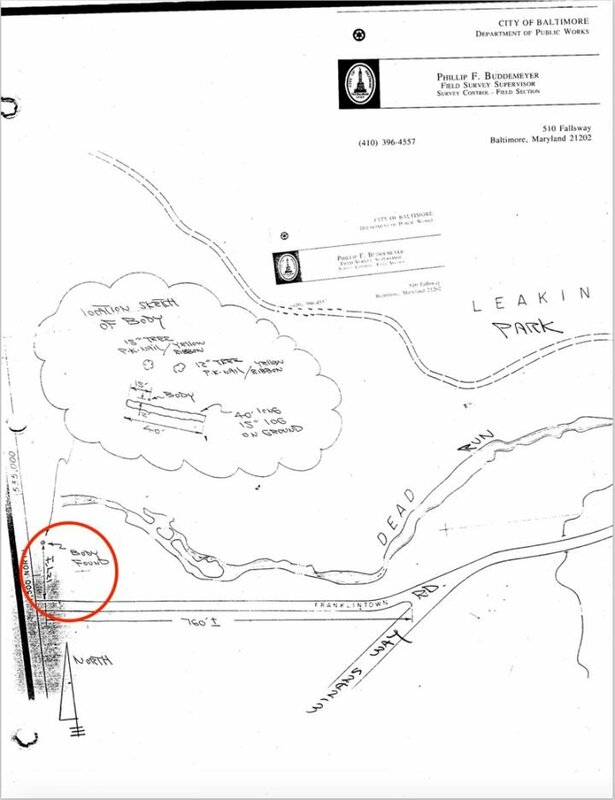 Then, on February 9, 1999, about a month after she went missing, her body turned up in a city park — Leakin Park — in Baltimore. She’d been buried behind a log, not far from a stream. A guy who said he’d gone into the woods to take a pee had found her there. He said he saw a bit of her black hair poking through the leaves. I’m going to call that guy Mr. S. That’s also what I call him in the story. 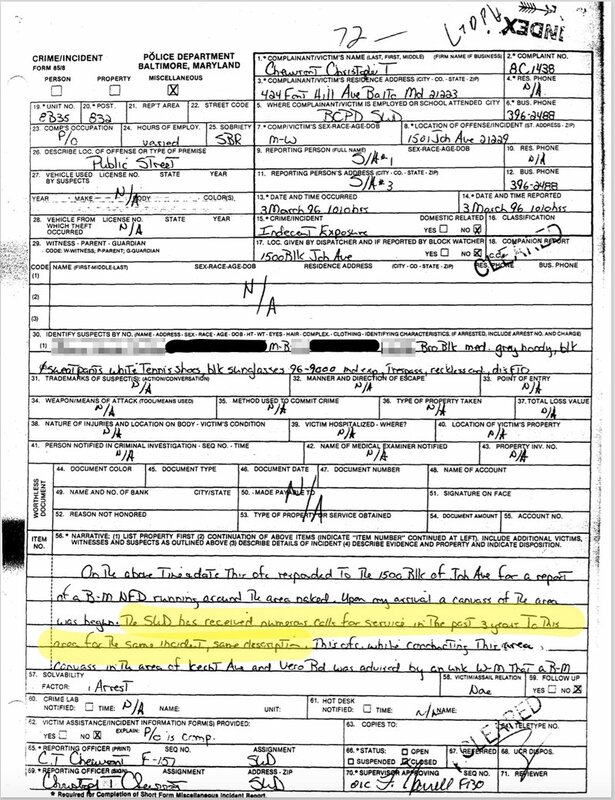 The detectives spent quite a lot of time looking into Mr. S. He was their earliest suspect. So of course I really wanted to talk to Mr. S., too. But Mr. S. wouldn’t talk to me. I tried and tried. I called him; I went to his house a few times; I wrote to him. But he wouldn’t do it. Finally he asked me, by phone, to please leave him alone. Which I did. So, how do I get the story of Mr. S.? 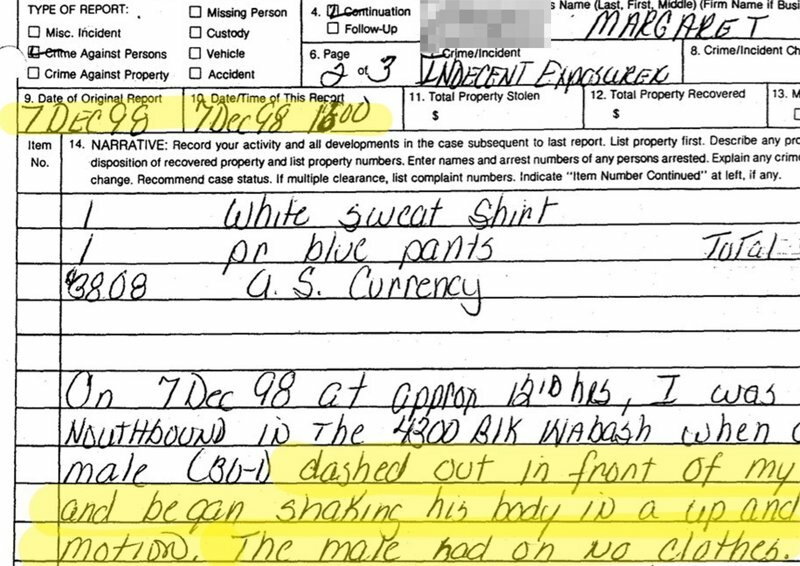 How am I supposed to figure out why the cops were so interested in him, and what they ultimately made of him? This little icon on my computer desktop is the Adnan Syed MPIA. MPIA stands for Maryland Public Information Act — it’s the public records law in Maryland that outlines what you or I or anyone can request from a public entity, such as a police department. 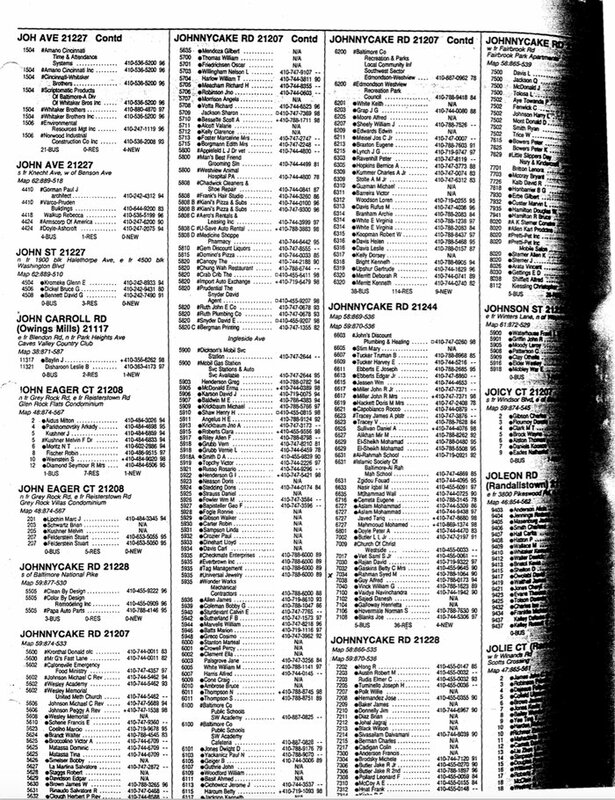 This is exactly what it looks like: A page from the Baltimore County phone book. 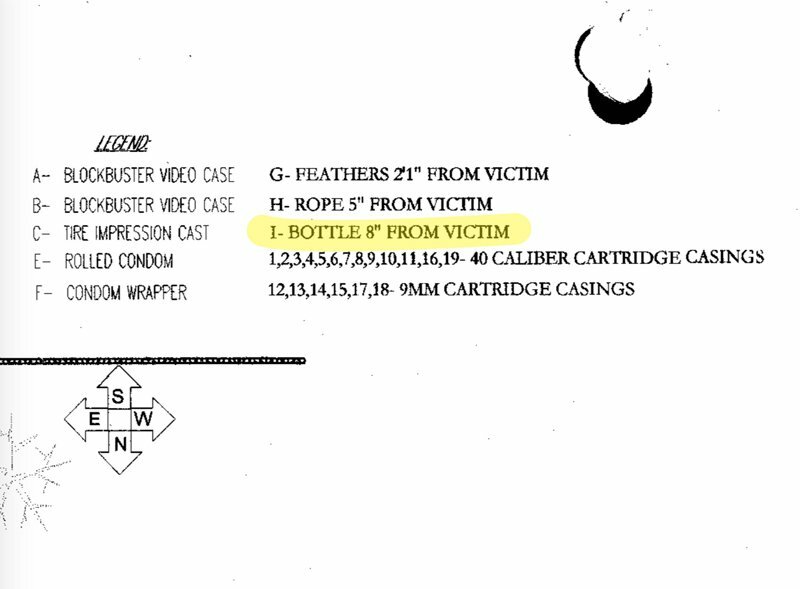 There were people’s elementary school records; people’s timecards from work; reports on calls the cops got from people who said they were psychics, and could help with the case. There were weather reports and VIN numbers and subpoena requests and . . . you know . 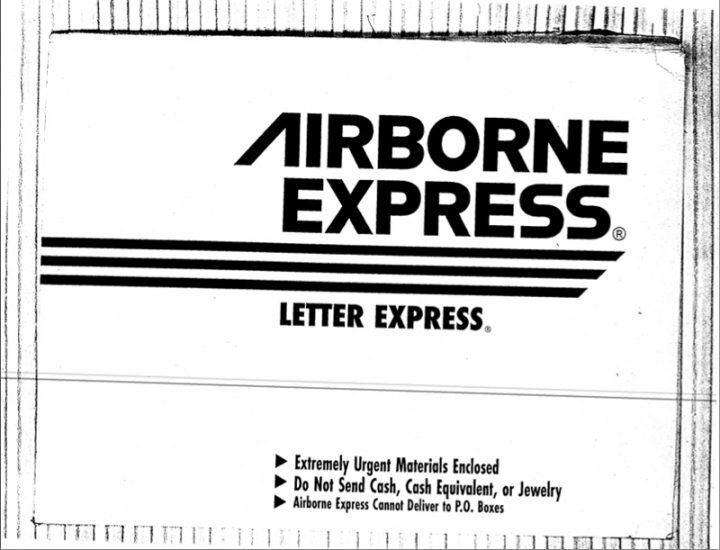 . .
An envelope! It’s confusing, right? Because you’re thinking, “Is this a clue?” Or . . . Which turned out to be incredibly important, once we figured out what it was: It’s the way cell phone towers are oriented and labeled. But nobody tells you this stuff! You just have to figure it out. Anyway, this stack of documents, once we befriended it, became the backbone of the entire series, more so than the trial transcript of the case. And it started to tell us stories. Discrete stories, such as the one about Mr. S.
This is from the Baltimore City PD. It caught my eye because, look at the date there: 1-13-99. That is the day Hae Min Lee disappeared after school. And this is a police report by Mr. S., the man who found her body. 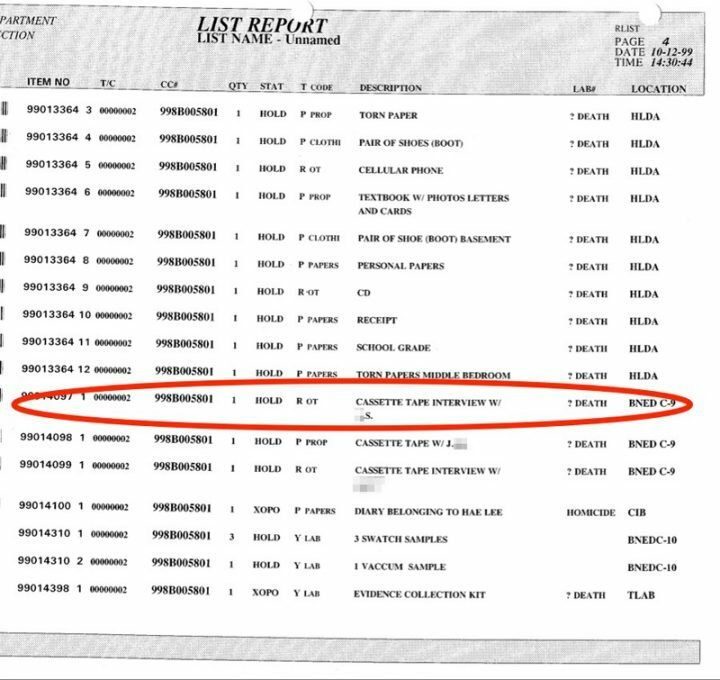 So, you know, I wanted to know: Why was Mr. S. filing a police report on the day Hae Min Lee disappeared? Is there any connection? This report says he was working in the ladies’ room of the school where he was a maintenance guy, and he went out to get a tool and when he came back, his walkie talkie was gone. So, a theft. He’s reporting a theft. 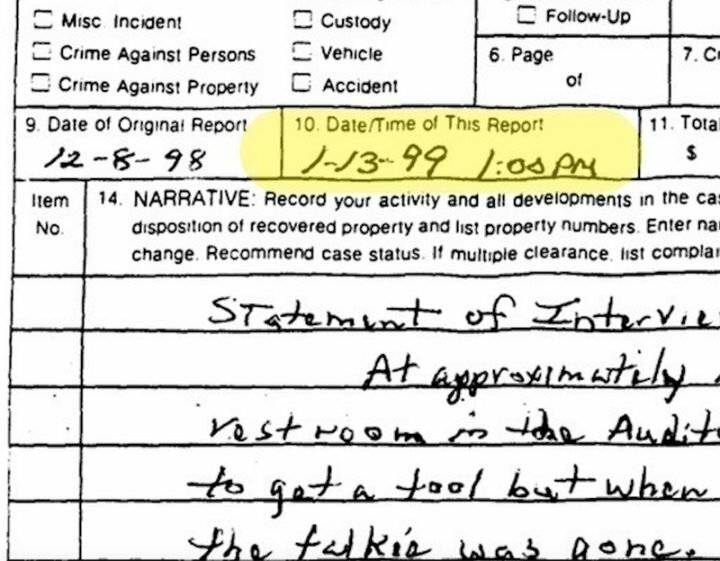 But look again, to the left of the yellow part, where it says: “Date and time of original report: 12-8-98.” Almost a month earlier. Ah. So this didn’t happen on the 13th of January. It’s probably not connected to the day Hae disappeared. Mr. S. is reporting this theft after the fact. Why? What happened on December 8th, 1998? The MPIA tells us what happened. That day, Mr. S. filed another police report, saying he’d accidentally left his truck unlocked, and someone stole all this stuff out of it: cell phone, keys, work clothes, cash. 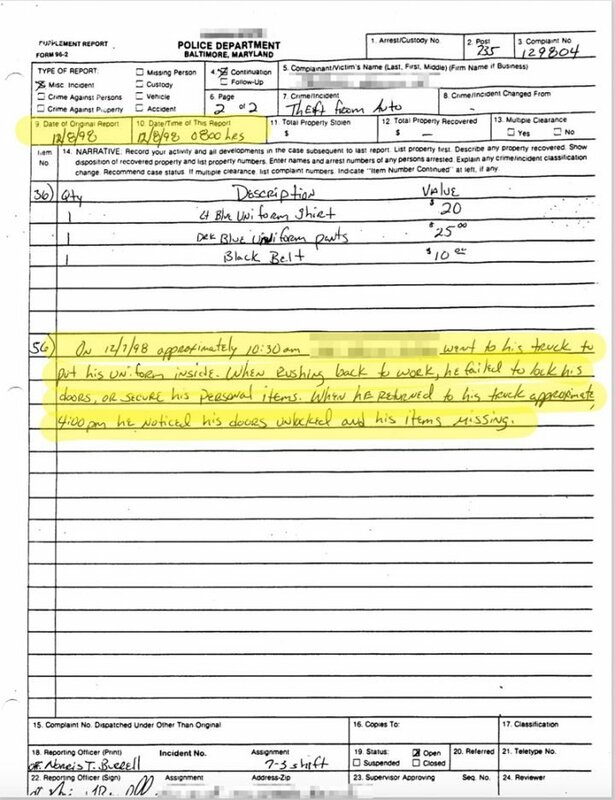 So not only does stuff get stolen from his truck, it also gets stolen from the ladies’ room the same day. When did all that happen? Well, let’s look here, date and time occurred: 12-7-98. Okay, so on its face, this is not interesting to me at all. I could care less if Mr. S. is reporting petty thefts. But the MPIA is about to change that. Because I keep reading, and I come upon a bunch of police reports, this time not filed by Mr. S., but filed about Mr. S. I find several reports for indecent exposure. And not just for peeing in public or something, but for streaking. Frequent streaking. This was written by a woman named Margaret. In this report she’s saying Mr. S. “. . . dashed out in front of my car and began shaking his body in a up and down motion. The male had on no clothes.” I love this story so much, because this lady, Margaret, is a police officer. In uniform! And it’s high noon, in the middle of a busy Baltimore street, and he’s totally naked, waggling in front of her car. And she’s a cop, so of course she chases him down. Margaret reports here that she finds a pile of his clothes, including his phone and his cash. When did this incident happen? December 7, 1998. That date looks familiar, right? That’s when Mr. S. is reporting the same stuff as being stolen out of his truck. So that was the clincher for me. Because this guy, now I know he’s crafty. He’s got moxie. He is willing to lie to get out of his scrapes with the law. But Mr. S. won’t talk to me. Neither will the detectives who questioned him. The prosecutors on the case — I interviewed one of them on tape, but wasn’t allowed to use the tape in the story. So no sound from them. I can’t talk to Adnan Syed’s attorney; she died back in 2004. But, the MPIA documents point me to some archival tape. The MPIA contains evidence review lists — basically a catalogue of all the evidence gathered during the investigation. And one of them lists a cassette tape of an interview with a person who has the same initials as Mr. S.
So we file a public information request with the Baltimore City State’s Attorney’s Office (that’s the prosecutors’ office). And after some weeks, they tell us there’s a box of stuff we can look at. I travel down to Baltimore, and voila, inside was a stack of tapes, including one of Mr. S., being interviewed by the cops. In this taped interview, Mr. S. tells the cops the whole story. So we get to hear his version of what happened the day he found the body. “I think I may have discovered a body in Leakin Park.” Mr. S. tells the cops he’d gotten a work order to shave down a door, but that the school where he worked didn’t have the tool he needed — a plane. He had one at home though, so during his lunch hour, he said, he drove his truck home to get the plane from his basement. 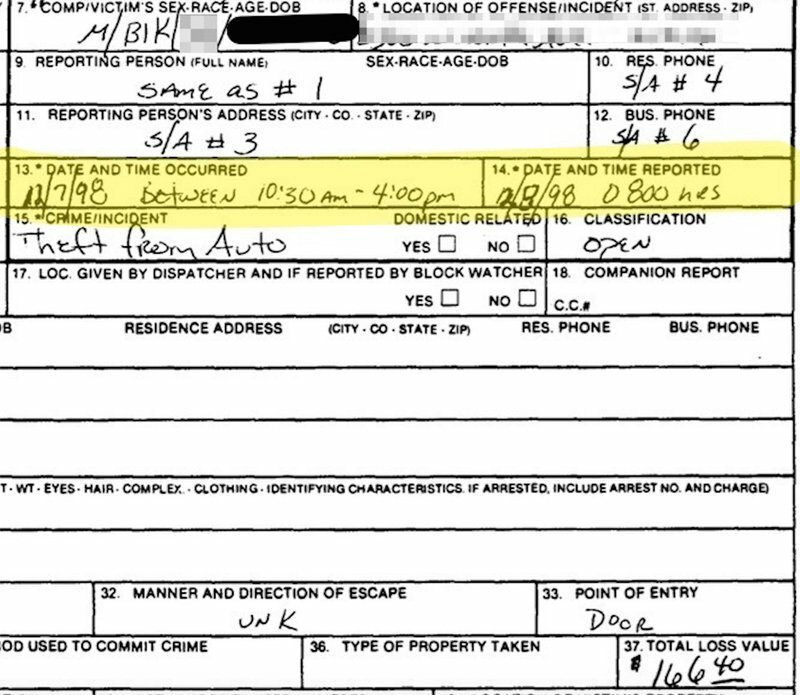 He tells the cops that while he was there, he grabbed a 22-ounce Budweiser from his fridge. Back in the truck, driving back to work — his route is through Leakin Park — he’s drinking this beer, and suddenly he has to pee, badly, he says. So he stops on Franklintown Road, where there’s a little pull-off, and he walks into the woods to find a place to pee. The detectives are suspicious of Mr. S., because there are parts of his story that don’t quite add up. The thing about the fallen tree is confusing, for one. Because the way Hae’s body was hidden behind this log, it’s not at all obvious that you’d see her if you were heading back into the woods, facing away from the street. The detectives are wondering: Did you really just stumble on this body, or were you looking for this body because you already knew it was there? Which is a reasonable question, because Hae’s body was very, very difficult to spot. How do I know? Well, when I went to look at that box of stuff we got from the State’s Attorney’s Office, there were a lot of photos from the scene, just as Mr. S. found it. Remember, the prosecutors wouldn’t talk to me on the record. So to build this part of the story, I used tape of me and this other reporter, Justin George, from The Baltimore Sun (I’d roped Justin into maybe writing about the case, too), looking at the photos for the first time. In February, Justin and my producer, Dana Chivvis, and I went out to Leakin Park to see what we could see. To be clear, this trip wasn’t manufactured just so I could have some tape. In fact, at this point in the reporting, I was still hopeful I would get the cops or prosecutors to participate. But we also taped anything we could while reporting this story, in case it became useful later. So here we were walking in the woods, trying to find the right spot. We didn’t guess at how far Mr. S. walked into the woods. We were trying to find the exact location where he found the body. I thought the snowflakes were a nice touch, until I realized they represent trees. 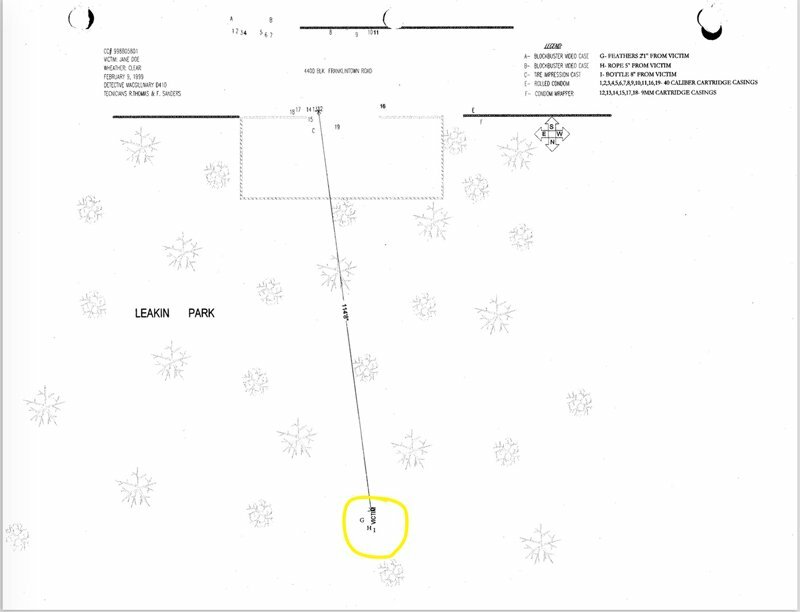 If you look closely, you can see that the top of this map shows you where they found all the different items they collected from the scene. I could have listed all this stuff in the script, but it might have been a little tedious for listeners, or hard to pay attention to. And that was a recurring challenge while reporting this story. The details mattered! We needed listeners to understand and remember the details for the story to hold together. So to make it a little more . . . lively, I guess, during the trip into the woods, I took the opportunity to lay out the evidence on that map for Justin, who was learning all this information for the first time. Brandy, Coronet. VSQ. 200 ml. That’s how I know. I didn’t use this tape in the episode, because we didn’t need it. 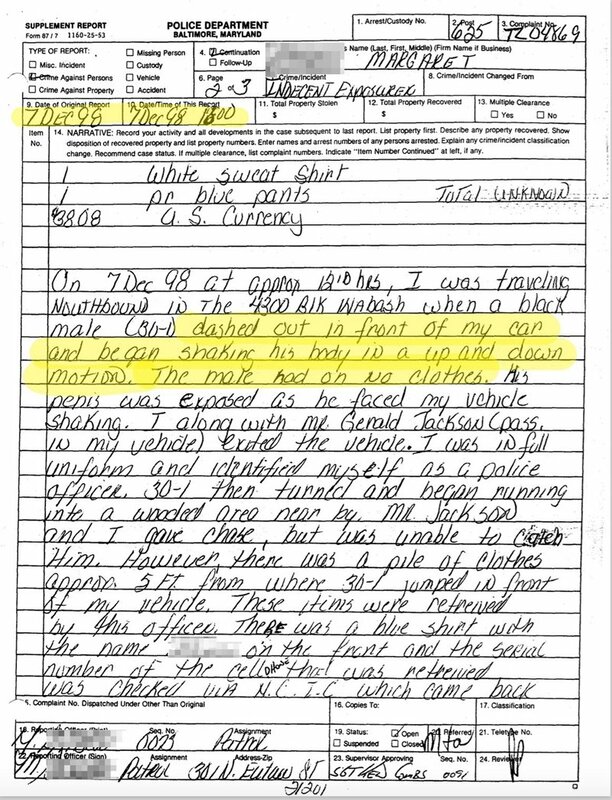 But it allowed me to interpret what the cops were after, and write about that with confidence in my script. What else do we need to solidify this story? So far all the “reaction” tape — especially about how hard it would have been for Mr. S. to see Hae’s body in the woods — is coming from Justin and me, which isn’t great. We’re just reporters. We don’t have authority or expertise about such things. And a listener could reasonably conclude that we were playing up our reactions for extra drama, to push the narrative forward. So how do I fix that? How do I get a more authoritative voice in here? I found a solution sort of accidentally. I had videotapes of about a quarter of Adnan Syed’s trial. 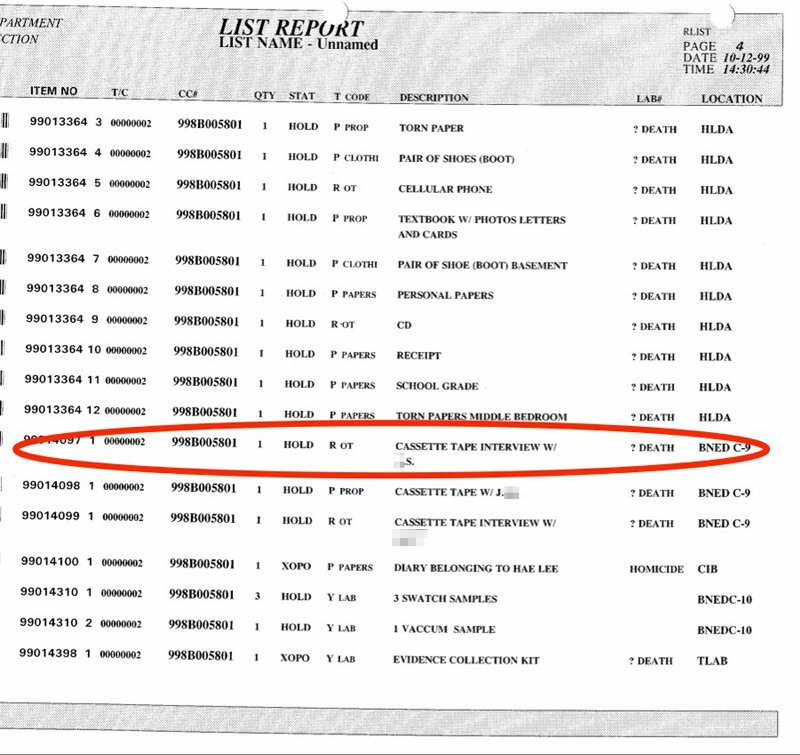 One of the tapes turned out to be mislabeled though — instead of February 23, 2000, it was really from February 22. 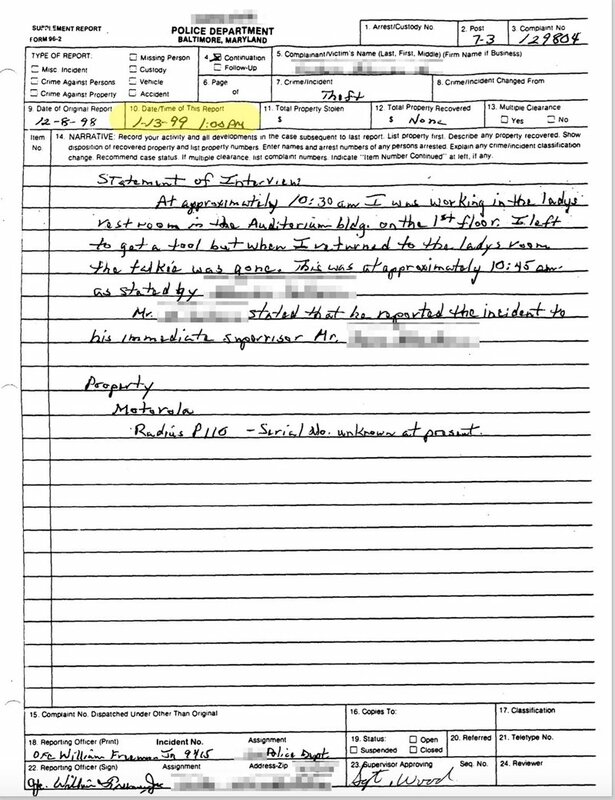 So I cross-checked the trial transcript from that day, to see who’d taken the stand as a witness. (I was trying to figure out whether I really needed to watch it; some of these tapes were four or five hours long.) I saw that some guy named Philip Buddemeyer had testified that day. And I thought . . . Buddemeyer, Buddemeyer . . . where have I seen that name before? And I remembered: the map! See his business card up there? 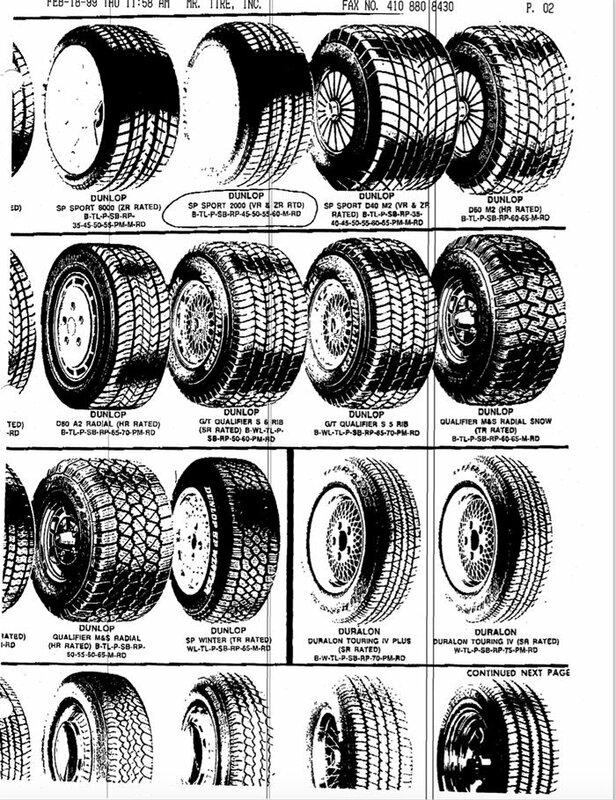 These elements were the building blocks of episode 3 of the podcast: documents from the MPIA; archival detective interview tapes; scenes of Justin and me investigating and discovering stuff on our own; and a pinch of trial testimony from the city surveyor. The episode covered a lot of ground, and had a lot of action. And zero interviews with the main characters. Which, again, not a fact I’m proud of. Just a fact. Every story you do has obstacles of some sort. Things never come together perfectly. 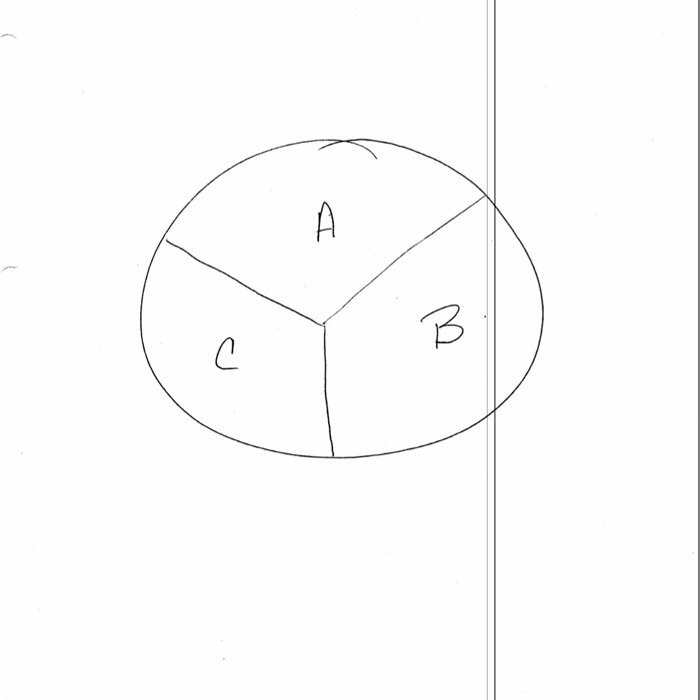 So the trick is to consider each obstacle, think through its particular, problematic features, and figure out if there’s a workaround. To hear how the entire episode turned out, you can listen here. *Photo of Sarah Koenig by Elise Bergerson. If you want more detailed, nuanced pieces like this one, please . 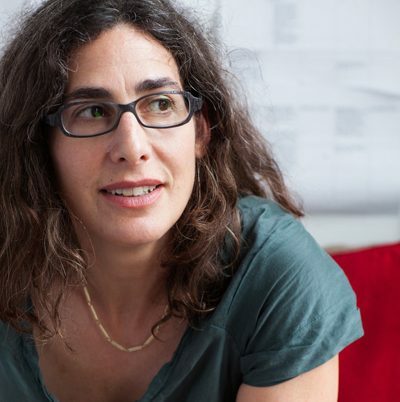 . .
Sarah Koenig was a newspaper reporter for 10 years before she took a job as a producer at This American Life. She was a producer there for more than a decade, until 2014, when she and Julie Snyder started the podcast Serial. Super smart. I’m no oracle, but she seems like the kind of person who could make a podcast that, like, a lot of people would download. This podcast is so wonderful!! I want more podcasts to listen to. You are very good at what you do. Do you have any more pictures of the crime? I kept looking for an audio file, lol, love your style and can’t wait for next season. I loved Sarah’s investigation of Adnan Syed’s murder case. 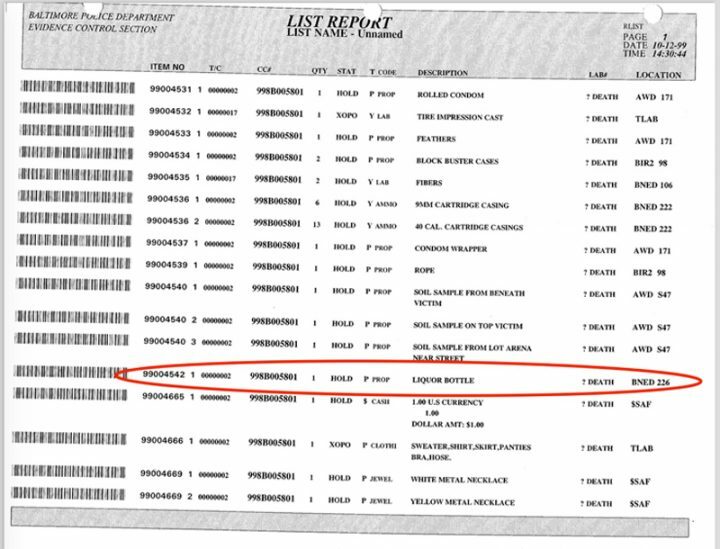 I had my doubts until Sarah asked Adnan why he never tried to call or contact Hae Min Lee after she disappeared. He had been talking to her almost everyday and then she suddenly goes missing, and Adnan never calls or tries to contact her again. Why? Any other guy would have been calling her continually because he was worried about her and wondering where she was and was she ok. Why didn’t he? Because he knew she was dead. At that moment, I knew he was guilty. Except that her actual boyfriend at the time never tried to contact her either. And he wasn’t surrounded by friends who were all trying to contact her like Adnan was. So there’s that. He didn’t try to call either? So strange, and why is that? I didn’t realize that, it seems the whole case keeps tipping one way or the other. So many variables. I think she kind of teased him with her new boyfriend. Calling both of them when her car broke. It’s hard to believe he was ok with that. Well, now I have to rethink this mystery. Hi Andy. Sarah Koenig here. For season one of Serial, we had a core staff of three people, including me. As we progressed, we brought on more people to help as needed – with mixing, fact-checking, web stuff, etc. We began working on Serial full time in January of 2015 (I’d begun reporting the story a few months before that), and the first season began airing in October of 2014. In terms of money, we were incredibly lucky. Our boss at This American Life, Ira Glass, paid for season one with no restrictions that I can recall. He basically said: ‘Do it. Spend what you need to spend to make it as good as it can be.’ So we were in this incredibly rare situation in which we could do whatever we wanted, and we really didn’t have to worry about the money, because we had the backing and trust of TAL behind us. Since then, we’ve paid for ourselves.